Guttering is available in a choice of styles to suit different buildings and different tastes. Quality ranges are also available in colours: white, brown, black, caramel, and anthracite grey. Suitable for the roofline of both traditional and modern homes. A scalloped shape gutter designed to give a more decorative finish to your roofline. A deeper style suitable larger roofs and larger volumes of rainwater. Your installer will be able to recommend whether your home would benefit from this product when he advises you on your guttering replacement. 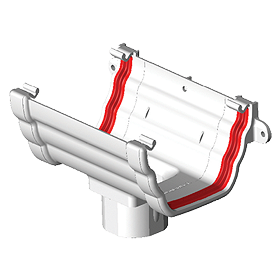 Freeflow™ is Freefoam’s range of gutters and downpipes designed to give a leak free solution. White inside. 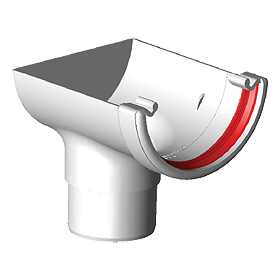 Freefoam are one of the few companies who make guttering with a distinctive layer of white PVC inside. This white layer cleverly reduces the amount of heat absorbed by the gutter on a hot day which in turn reduces (by up to 40%) the amount the gutter expands and contracts as it warms up and cools down. Red seals. 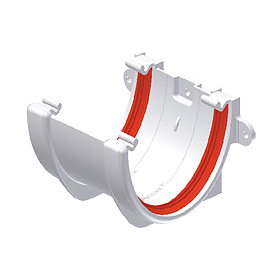 Our guttering includes red long-life advanced compressible seals which are used to create flexible water-tight joints when connecting lengths of guttering together. 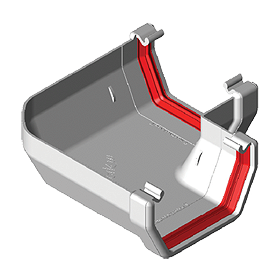 These allow the gutter to move – without making a noise and without creating the gaps which cause leaks. No more leaks and creaks! Reducing gutter movement significantly reduces a major cause of leaks and also reduces those annoying gutter creaks. So if you don’t want leaky, creaky gutters when you replace your guttering Freefoam is the answer. Integrated Range. When looking into roofline repair and replacement make sure you choose a manufacturer that offers a complete suite of integrated fasica, soffit and rainwater products - where all the different elements have been designed to work together for better results. Fill in the simple quote request form and we’ll do the rest. We’ll find you a registered, local and reliable installer. Can't tell your soffit from your box end, don't worry we're here to help. Get in touch one of our Customer Service Team will be only too happy to help.